Stewart left Houston without saying goodbye in 1987, just as the art scene she helped establish finally began to blossom. Few friends knew where the pioneering sculptor went: not her most recent art dealer, nor her agent, nor people who’d been close enough to visit her weekly. Her success came at a time when women sculptors were rare birds in a man’s world. […] it was a coup when Houston accepted “Atropos Key” …. in 1972. Stewart’s sculpture was unlike anything else in the landscape. When it comes to Stewart’s departure from Houston and the art world, Glentzer arrives at the same conclusions we did. Stewart first returned to Birmingham to care for her ailing brother, and chose the Southwest as a part-time home because she was drawn to the “light and open landscape”. However, her move to Albuquerque in the final years of her life hinted at grander plans. And so the answer to one question opens up another mystery. What did Stewart plan to do next? Her friend Dayton Smith told us she may have intended to complete some larger projects and return to Houston. In her sketchbooks from the 2000s Stewart often mentioned a series of sculptures called ‘Harmonic Resonance’ that may have been her forthcoming magnum opus. Other friends of Stewart who have called or visited us since the appearance of the Chronicle article had few answers. An acquaintance who took yoga classes with Stewart for years said he’d lost contact with her in the 1980s before she left Houston. Another friend who stopped by told us vivid stories from Stewart’s life in Houston, but had just as many questions about her Southwestern exploits. Then, late last week, we received a call from Dr. Liam Purdon in Nebraska. We recognized his name from an elegant essay in Stewart’s files. In the 1980s, Purdon was working on a PhD in medieval literature from Rice University. 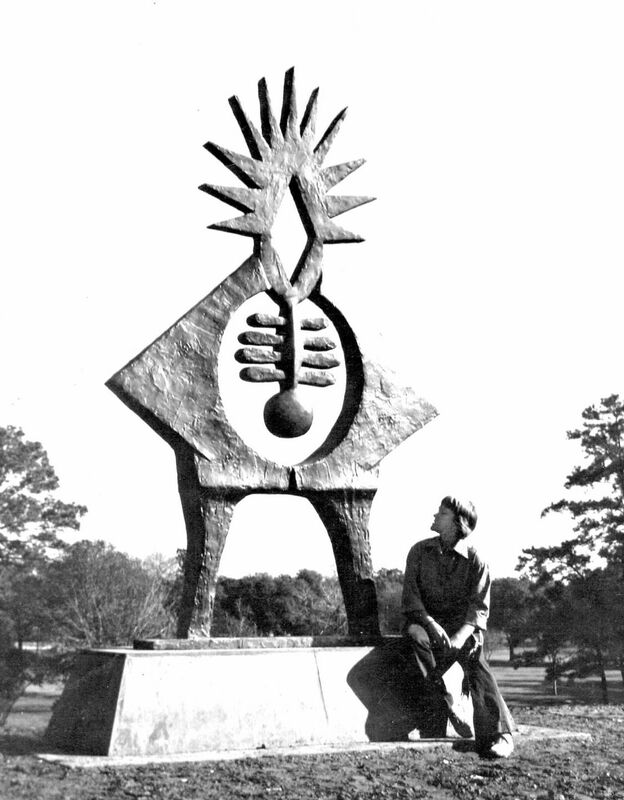 He had seen Stewart’s “Atropos Key” sculpture in Hermann Park and was inspired to contact her. Purdon said the shock and curiosity he experienced was Stewart’s overarching goal. “She wanted to startle the observer into recollecting the whole mythology of a time when humans lived in harmony,” he explained. Stewart agreed to let Purdon observe her in the studio for three weeks, but kept a careful distance from the scholar. Later on they became good friends, and Stewart told Purdon her plans for the future. The two stayed in contact after Purdon took a teaching job at Doane College in Nebraska, and Stewart expressed interest in applying for public art commissions from the Nebraska Arts Council. When nothing materialized, Stewart was discouraged. That’s the closest we’ve gotten to answering the ever-shifting riddle of Stewart’s twilight years, but perhaps it’s enough to know that people are ready to hear the artist’s stories again. We’ve had a huge response from collectors in Houston who read the article, and art lovers from across the country have discovered her work as a result of the press coverage our show has received. Come see Hannah Holliday Stewart: An Artistic Legacy Rediscovered through Thursday, July 24, and learn more about the artist on our website. Make sure to connect with us on Facebook, Twitter and Pinterest for more gallery news! At last Friday’s opening for Hannah Holliday Stewart: An Artistic Legacy Rediscovered, art enthusiasts who saw the press coverage for the show came armed with a diverse array of questions. Of course, the most frequent question was also Stewart’s most impenetrable mystery: why did the sculptor abruptly leave Houston, the launching point and epicenter of her nationally renowned artistic career? In our explorations of Stewart’s archives over the past few weeks, we’ve stirred up as many questions as answers. Stewart was resolutely private, preferring to tightly focus on her artwork in interviews, exhibition materials and even her diaries. A catalog for her 1975-6 solo exhibition at the Houston Contemporary Arts Museum provides little more information on Stewart’s personal life than a birth year and a brief sketch of her educational history. Many of Stewart’s works, on the other hand, were always in the public eye. Kids lounged in the crook of her 11-foot sculpture in Hermann Park, students at St. Thomas University studied under her concrete-and-steel work on campus, and politicians were often photographed beside her “Libertad” fountain as they passed through the courtyard of Houston’s World Trade Center building. For this week’s blog, we’re taking cues from Stewart’s ghost and focusing on the rich universe of her sculptures. Look below for new insight on five artworks, with behind-the-scenes materials from the artist’s files. “Out on the hill beyond Miller Theatre the blanket lollers who tune in to night concerts and shows from a horizontal position will have fresh ‘company.’ Overlooking the stage, now, is a bronze vertical figure. ‘Atropos Key,’ the title of which derived from one of the three fates in Greek mythology, was given to the city by Mrs. Patricia S. Woodward of Houston. Stewart’s ‘Messenger’ appeared on the cover of Houston Arts Magazine’s performing arts edition in October, 1982. Stewart was a fan of Russian composer Alexander Scriabin, and often listened to classical music in her studio. “Sculptor Hannah Stewart… sees her work as an artist’s shorthand using symbols to communicate complex and abstract ideas— like a composer uses the symbols of musical notes to convey a spiritual idea in a sensuous form. Stewart was known for her mythology-inspired artwork, but that was far from the only subject she explored. “Her studies in literature, mythology, metaphysics, esoteric philosophy, religion, science, astrology, dance and yoga suffuse her output, revealing in form and textures,” wrote Stewart’s friend Dayton Smith in a letter to the gallery. In ‘Ockum’s Razor’, Stewart turned to science for inspiration. The title refers to a problem-solving principle devised by 14th century logician and Franciscan friar William of Ockham (c. 1287-1347). The principle states that “Entities should not be multiplied unnecessarily.” In other words, the simplest path to an answer is the best one. 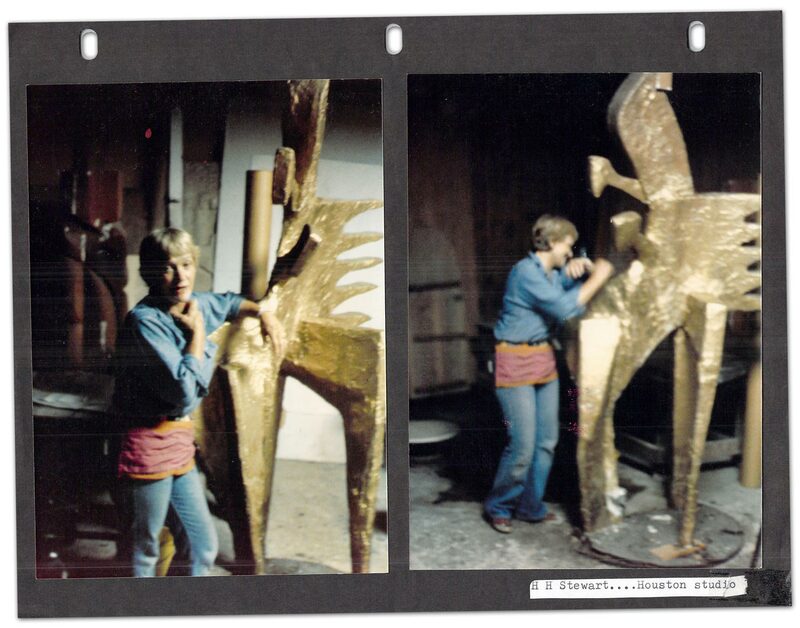 Stewart was 80 years old in the Polaroid above and still hard at work on her bronze forms, though she never exhibited again in her lifetime. See Hannah Holliday Stewart: An Artistic Legacy Rediscovered through July 18, and connect with us on Facebook, Twitter and Instagram for more information on the artist.